Listen Hear Diagnostics uses the most advanced technology available to expertly assess your hearing ability. The results are carefully recorded and discussed with you and your family. These are performed to evaluate the outer, middle and inner ear. Each test determines the function of the ear and identifies any possible cause for hearing loss. The evaluation starts with a physical examination of your ears. The audiologist uses an otoscope to look in your ears and ensure they are free from wax build-up. For the most accurate results, the ears should be wax free before the test. Immittance testing is performed to rule out the possibility of any dysfunction of the middle ear or medical problem. Any disruption in the outer or middle ear that indicates a possible hearing loss will lead to further testing of the inner ear. An otoacoustic emissions test determines the status of the outer hair cells in the inner ear. Conductive hearing loss occurs if sound waves cannot pass through. Sensorineural hearing loss occurs if the hair cells, auditory nerve or cochlea is impaired. 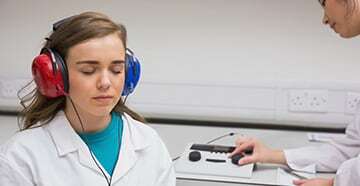 Bone conduction and pure tone audiometry are performed in a sound-treated room. Headphones and a bone conduction headset along with pure tone audiometry identifies the lowest level you can hear in each ear. You will be presented with a series of tones that cover a range of frequencies. Lastly, speech audiometry will be used to confirm the results of the pure tone audiometry. You will be asked to repeat a series of words. If hearing aids are recommended, this test of speech cognition aids in proper fitting. Allow at least 30-40 minutes for your exam. 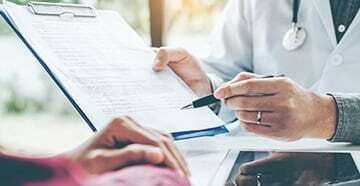 If the exam indicates you need hearing aids, you will want plenty of time to discuss your options. We encourage you to bring a family member or trusted friend with you. You may feel more comfortable with a supportive person with you as you review the results and recommendations.